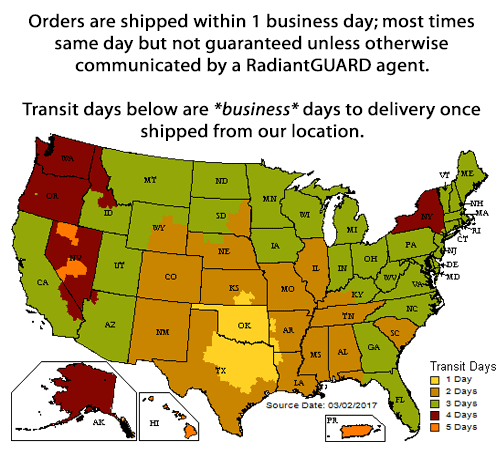 RadiantGUARD® radiant barrier lowers your heating and cooling costs by reflecting radiant heat back to the heat source making your home more comfortable both in the summer and winter months saving you money year round. Our Ultima-FOIL radiant barrier BLOCKS 97% of the thermal radiant heat energy from passing through and is comprised of two layers of 99.9% pure aluminum and is reinforced with a fabric scrim creating a highly durable tear-resistant product perfect for stapling and nailing without the fear of pulling through the material. Based on how you intend to install radiant barrier, determine whether you need the breathable or vapor barrier version. Learn how Ultima-FOIL radiant barrier differs from our Xtreme-MET metalized radiant barrier.